It’s so crowded in that trough, they’re probably wondering if they’re on the New York City subway. I believe I saw one of them scrawling graffiti on the walls. They need to get outside, and soon. Trouble is, the raccoons and possums are already outside. 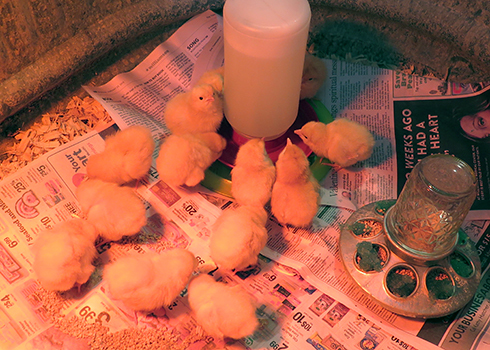 We can’t move the chicks out there until they have a secure place to live. So we’ve been out there for long days, trying to get the first of the two chicken yards finished. Not done, but getting there. 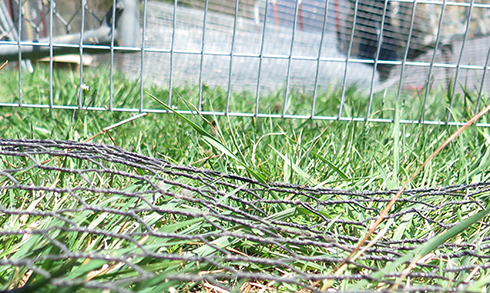 The biggest pain in constructing a chicken yard is stretching the wire fencing between the posts. The stuff arrives in big rolls, and when you unravel it, it desperately wants to roll itself up again. Add in the fact that our land is hilly, with the angle of the hill seeming to change every few feet or so, and stretching the fencing tight across the posts and close to the ground is a wee bit of a challenge. We made the job a bit easier by buying a fence stretcher. Fence stretcher … sounds like a cool contraption, eh? Something with levers and gears? Nope. It’s basically a 2 x 4 hunk of wood with two handles and a metal bar that clamps to the fencing. Tighten down the metal bar, grab the handles and pull for all you’re worth. Then crouch there in that awkward position while your wife uses zip-ties to strap the sort-of-tight fence to the t-posts. Be patient. She’s going as fast as she can. Those aren’t the exact directions, but they should be. The zip-ties are a temporary measure. Once each section of fence is in place, we use metal clamps that hook to the fence, bend around the t-post, then wrap around the fence on the other side of the post. 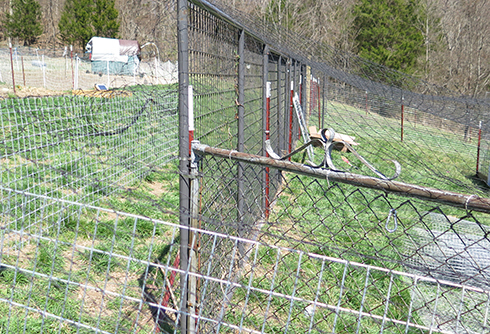 The chicken yards may become corrals for larger animals someday, so we attached four clamps to each pole. Even with a properly-stretched fence, we ended up with gaps at the bottom here and there because of the dips in our land. Chickens won’t try to push under the gaps, but (as we learned the hard way with our chickens in the front pasture) a hungry raccoon or possum will. If we don’t fix the gaps, we may as well ring the raccoon dinner bell. So Chareva will attach heavy-gauge chicken wire all the way around, then bend it out along the ground and attach it with garden stakes. That protects against predators taking the low road. We also have to protect against predators that would climb over the fence and hawks that would swoop down for a chicken dinner to go. Last year we covered the front chicken yard with a big ol’ net that’s done the job quite nicely. 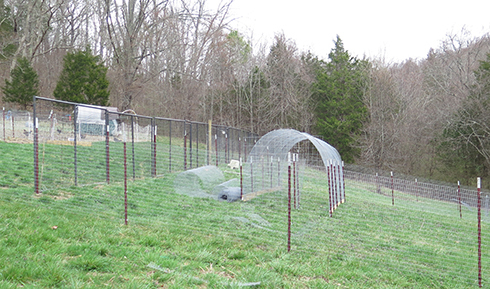 We’re going to cover both of the new chicken yards with the same size and brand of net. That’s a dog kennel that’s been sitting in our front yard for years, serving no purpose whatsoever. Notice the human-sized doors. Instead of just using those, I suggested we take the whole thing apart and use it as fencing on the uphill side of both chicken yards. That would raise the net nice and high on one side at least. Chareva agreed, but reminded me she helped a renovation crew-member move the dog kennel three years ago. Those panels are really heavy and will be difficult to carry up the steep hill, she warned me. Nope. Not light, but not all that heavy either. As we trudged them uphill, she kept saying she could swear they used to be heavier. It occurred to her that she’s done three years’ worth of farm work since moving them the first time. She’s probably stronger now than she’s ever been in her life. Anyway, re-purposing the dog kennel was the perfect solution. 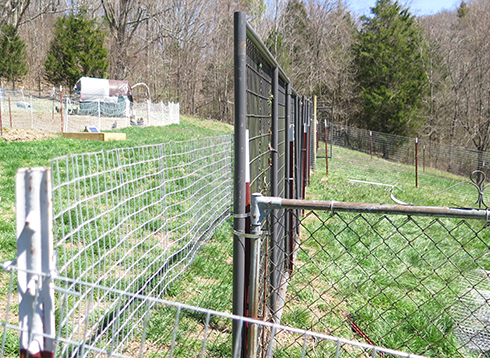 Each chicken yard now has a tall door on the high side of the hill, and with the panels all bolted together, they make for a sturdy fence. I had to pull up several t-posts I’d pounded in last week and re-position them against the poles in the panels, but it was worth the effort. 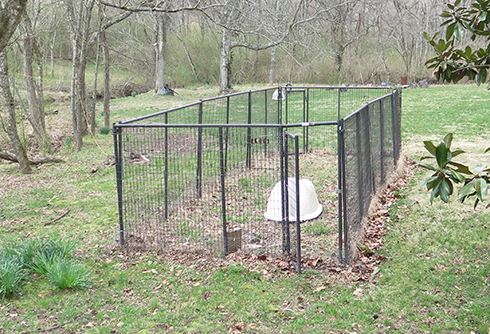 Unfortunately, when I bolted together the last panel at the far end (the other chicken yard we’ll finish later), I had a major brain-fart: I saw a four-foot gap between the end of the panel and the line of t-posts I’d pounded in last week. Rats, I said to myself, these don’t line up. We must have measured something incorrectly. So I pulled up several posts, tied a string from the panel downhill to the corner post, and pounded in the posts along the string. If you take a peek at Chareva’s plans, you’ll recognize my mistake. I added a red line where I re-positioned the posts. Whoops. Hours later, Chareva informed me the “gap” was intentional. That’s the opening for the “Flock A” chicken moat that will extend around the future garden. 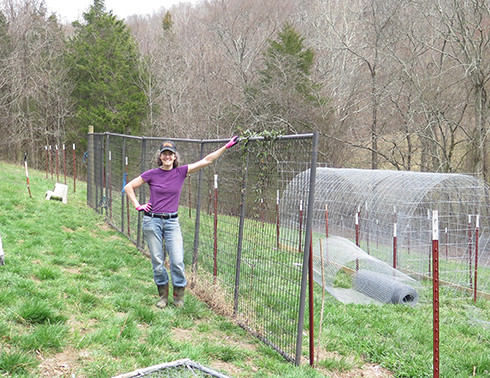 So when we get around to that chicken yard, I get to pull the posts again and pound them in for the third time. I’ve mentioned that pounding posts is a great workout for the triceps. If I keep goofing up like this, I’ll have triceps bigger than my thighs. 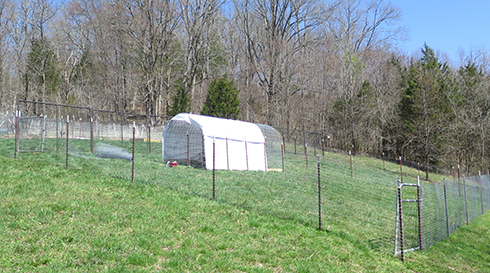 The hoop houses will be made from cattle panels bent into a U-shape and covered with vinyl. New vinyl that’s sufficiently thick is expensive, but Chareva found a deal on some that were previously used for highway billboards. (I was hoping one of them would have a BETTER CALL SAUL ad on it, but no luck.) She has the first hoop house almost ready to go. We need to close off the chicken moats at night so predators don’t climb the garden fences and sneak into the chicken yards through the moats. We also need the nets to be secured to the fence all the way around. Obviously, we can’t attach the nets to the gates that open the chicken moats. So we attached a bit of fencing over the entryway to the moat. The gate will close against the bottom of the fencing, and the net will be attached to the top. I may also string a little barbed wire in between to discourage raccoons from trying to push between the strip of fencing and the top the of the gate. Raccoons are determined little critters. 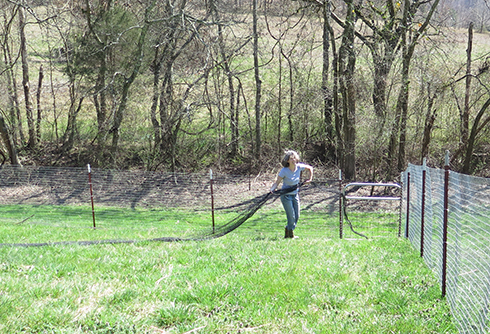 When Chareva and I unrolled and positioned the giant net over the chicken yard in the front pasture last year, we had so much fun it nearly ended in divorce. Well, okay, it wasn’t that bad, but it was frustrating. We couldn’t quite figure out how to unroll the thing at first, plus it kept getting snagged on the barn. We remembered the lessons from that experience. This time Chareva put a tarp over the metal snaggy bits on the hoop house, and we were able to unroll and position the net pretty quickly. The net is where it needs to be now, but loose. Later this week we need to tie it down to the top of the fencing on all four sides. 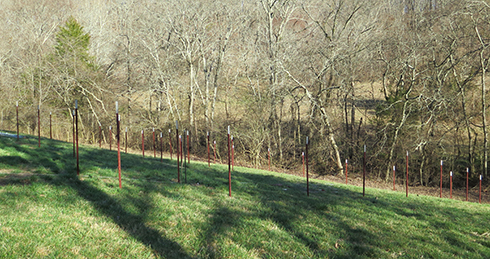 Then we’ll sink some poles into the ground to provide elevation on the low side of the hill. 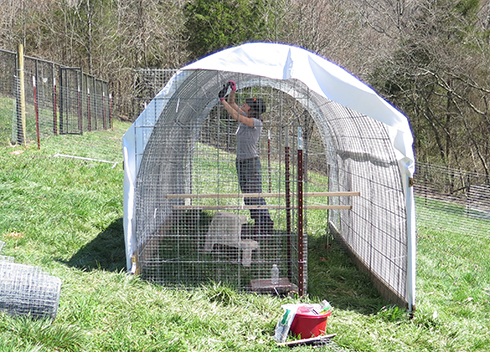 Ideally, we’ll be able to walk around most of the chicken yard without ducking under the net. When all that’s done and the hoop house is finished, we can finally get the chicks out of their subway car. I love the chicken moat. Put those chickens to work, earning their keep! Wow! A lot of work just to keep chickens alive! Yup, but if this all works as planned, we’ll end up with a nice rotation system with four distinct spaces. On the off chance that it is not as amusing to perform that as it is to read it, may I suggest that you purchase a come along? 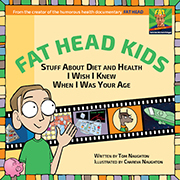 They are available on Amazon and your local farm supply store undoubtedly has them. It will come in handy for lots of farm chores. Never heard of it, but I’ll certainly take a look. I think he means one of these things. I have seen one used before to secure things on the back of a truck or trailer. They work pretty good as I recall. Turns out the previous owner left something like that behind. I’ve watched videos of people using them. My concern is that by the time you pull that hard on a t-post, it will just tilt. The people I saw using them online were pulling fences across deep posts. My dad owned a fence company. couldn’t have built the fences without the come-along. I’ll try one on the next chicken yard, but I’m worried the tension will be too much for a lowly t-post to withstand. You can apply only the amount of tension you desire. It will just take the place of you leaning back and struggling while Chareva does the fastening. That alone would make it worth it. We’ve looked into it, but haven’t built one yet. As for critters going under a fence, I once had a fence engineer tell me that he uses 18″-24″ lengths of rebar pounded vertically into the ground every 6 inches. This was to keep his dogs in, but you could probably adapt it to keep critters out. If you can find some rebar on the cheap and can cut it. That’s a lot of rebar. 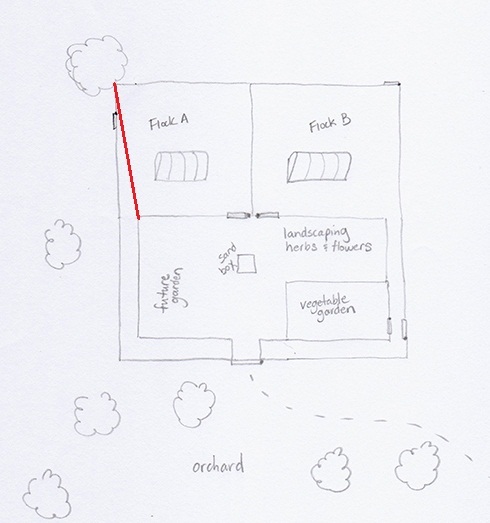 Our chicken yards are 45′ x 45′. 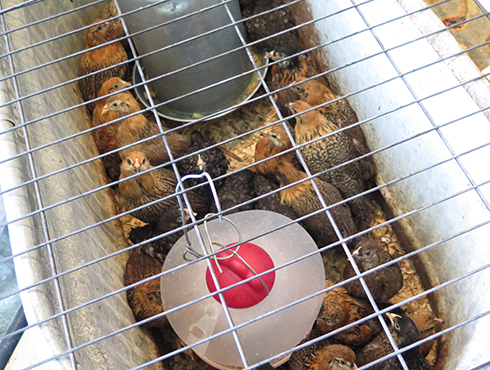 A method I heard for keeping critters out is to dig out a trench about 4″- 6″ deep and a foot wide around the fence, Bend the chicken wire to a 90* angle, lay it in the bottom of the trench, secure the upright to the bottom of the fence, then fill in the trench. The critters will start digging at the base of the fence and hit the chicken wire, They will try to dig out a bit, but find more chicken wire. They can’t dig under it and they give up before they can dig around it. 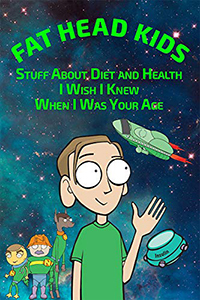 They shake their tiny fists at your house, say unpleasant things about your mother, and move on to easier pickings. You just have to do fence patrol and fill in the holes where they occur. I think I heard those unpleasant comments about my mother when we installed the electric fence. I don’t know; stinging insects seem to have a thing for me.